I had built a few projects, including a carputer for my '79 Camaro and a small computer out of a radio controlled car shell with flashing lights on HDD activity etc, all of which use ideas taken from this website. 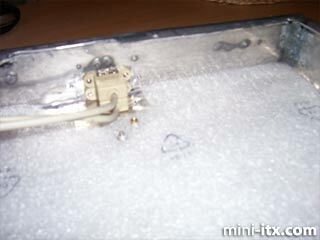 This, my first original computer design came out of frustration and I hope one day we will see a case that allows people to bolt together their own laptop in a weekend - and not have to spend days in the shed annoying the neighbours with my angle grinder and learning how to mig weld aluminium like I did! There are 'bare bones' kits from some manufacturers, but you are still expected to pay through the nose. To have one designed around standard Mini-ITX components would be great for the kind of people who do not want a laptop that we can fit in an envelope, rather a unit that we can use all around the house for a decent price. I decided to create a laptop that at any point, I could upgrade every component as they grew too old. 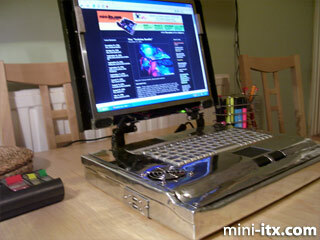 For very little money, I have created a 2GHz processor laptop with 1GB Ram, and an ATI Radeon 9200 128MB graphics card. OK, so it is a PCI graphics card and could be faster, but everything is upgradable - I could slot in a motherboard with PCI Express in the future. The size of this could have been a lot smaller. With a Nano-ITX mainboard and no external graphics card it could almost be as small as a regular laptop, but that was not my plan. It needed to be as powerful as a regular desktop or I could not use it every day for office applications and games. First I got all my components together, measured them and checked the layout in a cardboard box. Then I left it on the kitchen table for a few weeks and generally annoyed my girlfriend. 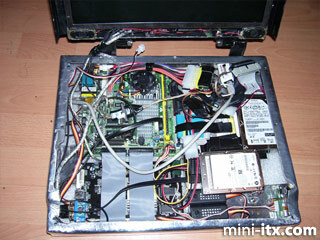 You can see the battery under the DVD drive and the PSU which I took from an old Morex case from Mini-ITX. The riser card cable is fabulous - it sits the ATI 9200 card nicely in the case. I made the main case from Aluminium to the same dimensions of my cardboard prototype, and started to fit my components. This is the USB extender cable. The 2GHz Jetway motherboard and low profile RAM. The slimline optical drive, laptop sized hard drive and two fan speed controllers. 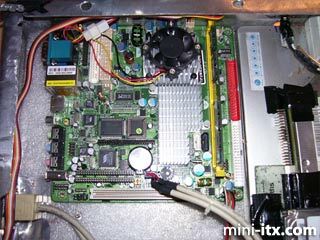 The power and reset buttons came from my original donor Mini-ITX case. I took the speakers from the monitor I dismantled. 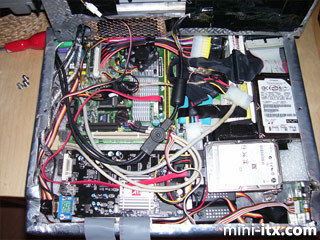 The plug and socket above the motherboard is the 12V supply to the monitor. The new improved internal layout. One IDE drive and one SATA drive. 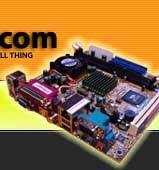 A 2 GHz motherboard with 1GB of RAM. You can see the fan controllers at the front, and the new Pico power supply which saves me lots of room. What cables and wires?